Preheat oven to 350 degrees F. Line 12 cup muffin tin with cupcake liners. Shred the zucchini and use paper towels to squeeze out all the excess water. Important step! Whisk together “dry” ingredients – set aside. In separate bowl whisk together “wet ingredients” – set aside. Note: ensure your zuchinni and milk alternative are room temperature so they don’t make your melted coconut oil solidify when combine them all together. Slowly and in batches add dry ingredients to wet. Mix until just combined. THE MIXTURE WILL BE RUNNY! This is a-ok. In fact, it’s the reason these puppies come out so delectably moist. Bake for about 20 minutes or until a toothpick inserted into the middle comes out clean (don’t mistake a melted chocolate chip for the muffins being under-done). Enjoy once cooled. 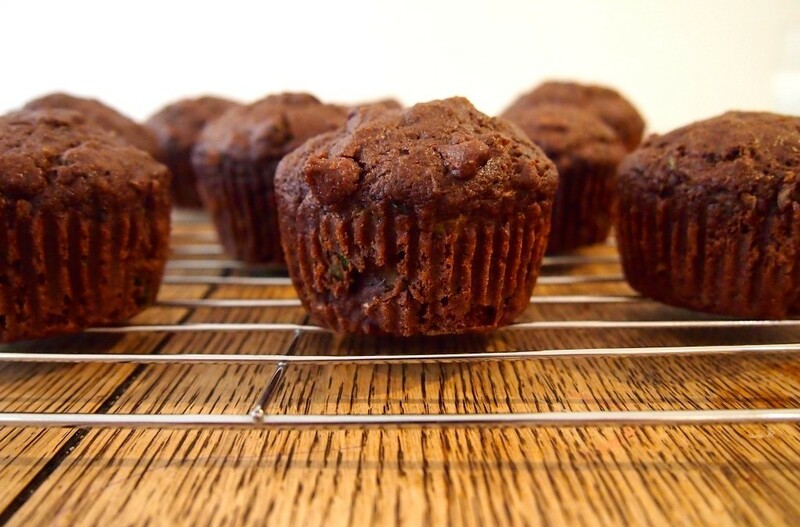 I do suggest you store these in the fridge since they’re super moist. Once stored in the fridge they become nice and fudgey. I use Canadian/US TBS, which are equivalent to 3 Australian teaspoons.